Really cool "now you can be the man in the monster suit." 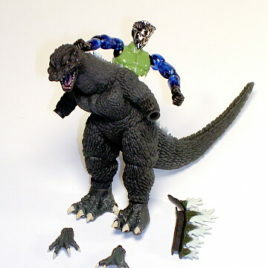 Microman is jointed and poseable to fit into the Godzilla 2005 suit. This is the Godzilla that was featured in the movie GODZILLA FINAL WARS! Approx 5 1/2 inch tall made of vinyl and plastic by Takara. CLAWMARK TOYS WARNING!! Small parts not suitable for very young fans. 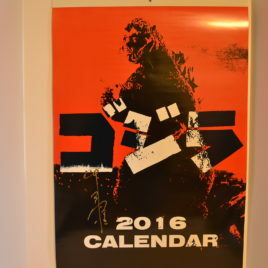 Here is a MUST HAVE item that is both practical and collectible; a Tokyo Event Only 2016 huge wall calendar autographed by Nakajima-san. The illustrious Mr. Nakajima attended the January 2016 Tokyo Super Festival and Diane of Clawmark Toys was there to see her old friend and his beautiful daughter Sonoe-san. The calendar is made of high quality glossy paper. It measures 30 inches long by 20 inches wide. There are 7 pages including the striking cover art. Each of the remaining 6 pages has two months. The movies chosen are Godzilla 1954; Mothra vs. Godzilla 1964; Godzilla 1984; Godzilla vs. Space Godzilla; Godzilla, Mothra, King Ghidora Giant All Out Attack aka GMK and Final Wars. 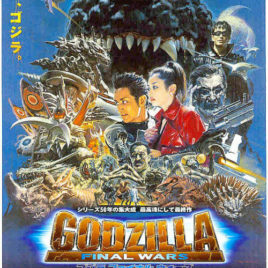 GODZILLA FINAL WARS "B" SHEET. TWO SHEET. Approx. 28 3/4 by 40 1/2 inches TWO SIDED. HARD TO FIND! Great Artwork of Final Wars Monsters and Cast. Shipped in Heavy Duty Poster Tube. 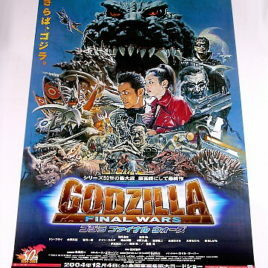 GODZILLA FINAL WARS ADVANCED STYLE TWO SHEET. Approx. 28 3/4 by 40 1/2 inches TWO SIDED. BREATH TAKING! HARD TO FIND! Shipped in Heavy Duty Poster Tube. This is the Hard to find Movie Monster Series Minya 2005 figure. 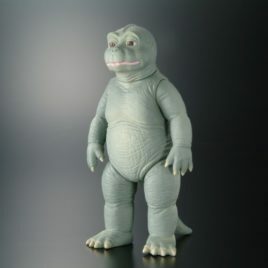 Loveable and goofy, the Son of Godzilla is a favorite Kaiju (monster) from Toho Studios. He was in several Godzilla films in years gone by. He is again featured in Final wars. This highly detailed articulated figure is in the Movie Monsters 6 inch Series. Comes Mint with Tag. 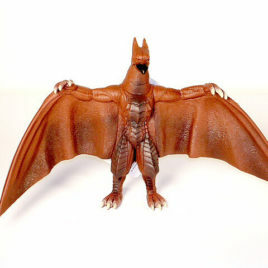 This is the original tag and paint version of Rodan from Godzilla Final Wars. It has a 2004 sticker. This version is NOW very HARD to FIND. Mint with tag. 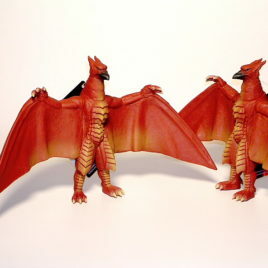 The photo shows two Rodans for better display but you receive only one Rodan. This is the last movie made so far! 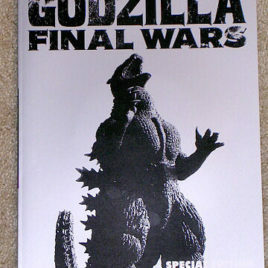 GODZILLA FINAL WARS 2005 CD ROM PROGRAM; 48 pages of color and black & white photos of the making of the movie, with interviews of cast and staff (in Japanese of course). CD ROM has hundreds of outstanding colorful images of the film, film production, Special Effects and information about the making of the film (in Japanese of course). This CD Rom is just full of wonderful color photos! GREAT SHOTS OF “ALL” THE MONSTERS!! (very limited supply available). GODZILLA RULES THE WORLD!! 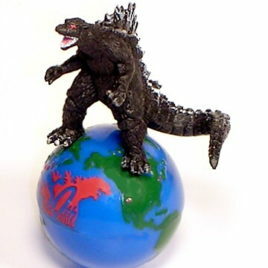 This is the Godzilla Globe that was available in theaters in Japan that were showing Godzilla FINAL WARS. The vinyl Godzilla Globe stands approx. 3 inches tall. The map of the world has red dots that represent where Godzilla has attacked. The Godzilla Wobbles, but he won't fall down. A very unique and funnnnnn Godzilla item. Limited supplies available. This BATTLE BOX HYPER GODZILLA 2005 originally came with super weapon Gotengo from GODZILLA FINAL WARS. This Offer is for the GODZILLA 2005 ONLY. 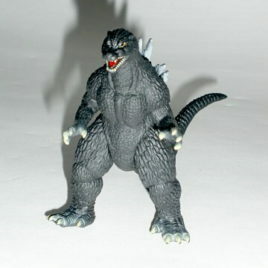 The Godzilla stands about 4 1/2 inches to 5 inches tall. It is articulated and detailed. No Box. Clawmark Toys Warning: Not suitable for very young children due to small parts. This vinyl figure is the latest incarnation of Mothra Adult. 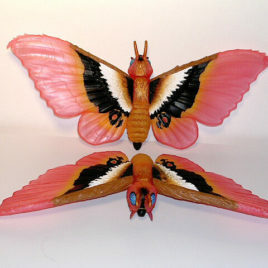 It is the "Fire Mothra" from the Toho 2005 film Godzilla "FINAL WARS". The wingspan is approximately 14 1/2 inches from wingtip to wingtip. The wings and most of the body are made of TRANSLUCENT VINYL!! The photo shows two mothras so you can see both angles. The Figure COMES in MINT Condition WITH TAG. This is the large size vinyl figure of the latest incarnation of Gigan. Stands approximately 8 1/2 inches tall. 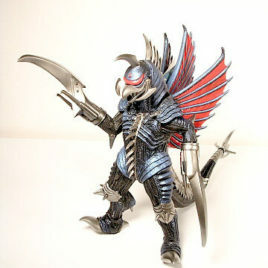 This is the Godzilla Final Wars Gigan with "Scythe" arms! Amazing detail! LIMITED SUPPLY BACK IN STOCK!! FIGURE COMES MINT Condition WITH Attached TAG. "Theater Exclusive" Rodan is all his glory from the Toho Movie Godzilla Final Wars 2005. 6 inches tall, MINT with Theater Exclusive tag. VERY LIMITED STOCK AVAILABLE. 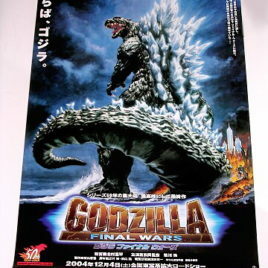 This is the GODZILLA FINAL WARS "CONTINUOUS" CALENDAR DIORAMA! What a unique Godzilla item! 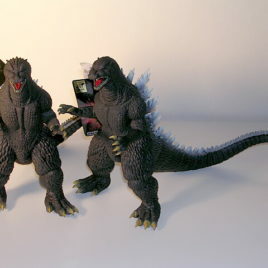 The Diorama is of Godzilla standing by (part way in) the Toho Office Building. 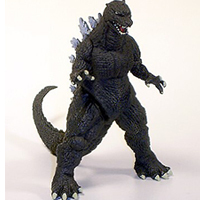 The Godzilla is a 1954 version and stands approx. 5 inches tall. Made of cast resin, this diorama is a resting place for the "cubes" that represent, day, month and year. The Months, and years are written in Romanji and the day of the week is in KANJI. 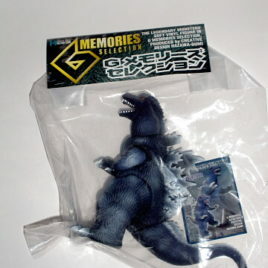 This is a THEATER EXCLUSIVE ITEM that was only available for sale in certain Japanese movie theaters that were showing GODZILLA FINAL WARS in 2004. This would make a great additional to any collection or it is functional on top of a desk! This Diorama Calendar comes MINT IN BOX. Scroll down to see additional photos.